This kit is A Must Have for all serious sword collectors. Why do you need to buy this cleanning kit? All metal parts of your sword should always be covered with a light coating of oil to prevent rust. The proper care and maintenance of swords is critical if they are to retain their condition. Sword Care: Caution - the blade of your sword may be extremely sharp and may cause serious injury if used inappropriately. Make sure that the blade edge is never in a position where it could injure you or others. Never clean or oil the blade with the edge toward you. Avoid touching the edge at all times. Use discretion and common sense when working around others. Only competent adults should use these types of weapons. The blade fits into the scabbard firmly to avoid accidental unsheathing. Do not unsheathe the blade by simply pulling the handle and the scabbard apart. Improper unsheathing can result in or wear to the scabbard throat and is dangerous. To correctly unsheathe the blade, hold the wrapped section of the scabbard with your left hand (edge side up) and the handle with your right hand. With your left thumb, push the guard away from the throat of the scabbard. When the friction resistance is broken, slide the blade gently from the scabbard, ensuring the back of the blade, not the edge, contains the scabbard during withdrawal. This avoids inadvertently dulling the blade and cutting the scabbard. To re-sheath the blade, hold the sword in your right hand, edge up and the scabbard by the wrapped section with the left hand, making sure that the scabbard is curving in the same direction as the blade. Carefully insert the tip of the blade into the throat of the scabbard and gently slide the scabbard and blade together, again making sure that the back of the blade, not the edge, is in contact with the scabbard. You will feel resistance when the guard is within approximately one inch of the scabbard, and slightly firmer push will then be needed to fully seat the blade. Always store your sword horizontally with the edge side up. This prevents the edge from bearing on the scabbard and preserves the condition of both. If the fit between the scabbard and the sword become loose through usage, please refer to the care instructions provided with your sword for details on a refitting. The scabbard of your sword is finished with many coats of black lacquer. 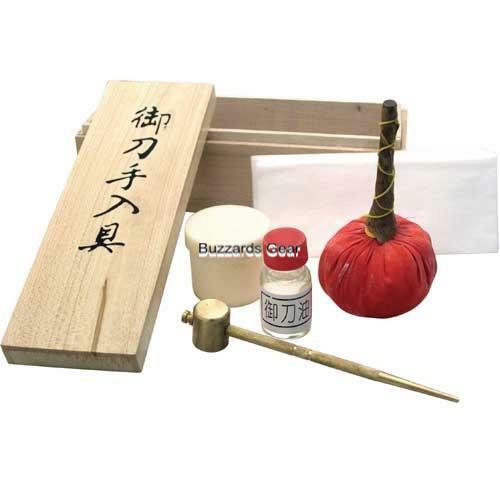 To preserve the sheen, the scabbard needs only to be wiped occasionally with a very soft cloth. Handle the scabbard only by holding the wrapped section, otherwise fine scratches caused by handling the lacquered sections will dull the finish. Tap the powder ball lightly against the blade every two inches or so along its length, dusting the blade very lightly with powder. (Note: when using the ball for the first time, you may need to tap the ball against the blade a number of times to "start" the powder flow through the fabric of the ball.) Then use a clean piece of rice paper or cotton cloth to carefully rub over the powder to polish the blade. Repeat until both sides of the blade have been polished and the powder is removed. Apply a few drops of oil along the length of each side of the blade and use a clean piece of rice paper or cotton cloth to spread oil evenly over the blade. Be sure not to touch the blade again before re-sheathing.